4th Day of Christmas: Let it Snow! in too much holiday cheer! I’ve been known to be a womanizing, alcohol drinking scoundrel. It wasn’t really my fault; I guess the years of abuse finally got to me. But that was a long time ago. I’ve cleaned up my act. My evolution goes back … way back, possibly to the Ice Age. I was around in the Dark Ages, for sure, a time of social chaos and repression. In fact, in 1511, the city of Brussels was inundated with many of my kind; an iconic presence that though silent, spoke volumes. Our sexually explicit and politically fuelled retaliation expressed an anger toward the church and local government. I had no control in the matter. I was at the mercy of the masses. I took it all in stride, as best I could, until the late 1800’s. It was then that I succumbed to the bottle and smoking. There’s no denying it. The proof can be found in the popularity of postcards and magazines at the time with myself the winter subject. A 1898 postcard has me carrying a couple bottles of champagne to an office party, already somewhat inebriated smoking a pipe. By the early 1900’s my party animal instincts were out of control. I was a pickled, skirt chasing lush; a frozen W.C. Fields in look and manner. With the end of Prohibition in 1933, I had become something of a spokesman for most leading liquor companies as well as personal hygiene problems ads-bad breath, gas and yes hangovers. Oh the shame! Aside from the pictorial abuse, I was also physically abused. Being the “snow man” target was a favourite past-time for young children in the 19th century variation of the game, “Aunt Sally”. Imagine being bombarded by snowballs all in an effort to score points, or being plowed over by sleds into a state of nothingness. Bludgeoned by brooms. And dogs. Don’t even get me started on that one. Merciless. even Cadillacs. It seems that society wanted a wholesome image of me, for the sake of the children; a presence that was family orientated and innocent. * Creating me provides a great aerobic workout, burning 240 calories an hour. * I’m an art form – Michelangelo sculpted snow figures in 1494 Florence, Italy. * I’m a reflection of the times; an artistic expression, unique. * Average number of snowflakes required in my creation: 10 billion. * The world’s largest snowman: 122 feet, 1 inch, Bethel, Maine, 2008. * I cost nothing to build – requiring only creativity and energy. * A detailed account of my evolution can be found in Bob Eckstein’s, The History of the Snowman. 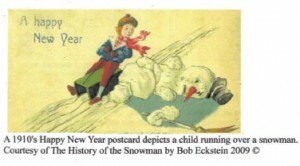 For more information about snowmen visit Today’s Snowman or get Bob Eckstein’s book The History of the Snowman. Anne Lindert-Wentzell has lived in Atlantic Canada for 22 years, being originally from the big city of Toronto. Rural living appeals to her. She enjoys the freedom of her acreage near the sea. Her husband, two dogs, two cats and the occasional visits from Captain and Tennille – two muskrats that now call her pond home – are pleasant company. She has a son in university. Anne started freelance writing seven years ago and has never regretted her career change. She has numerous articles both in print and online. This story previously appeared in the Chester Clipper in December 2009. Leave a comment on this post and you’ll be entered to win a signed copy of Miramichi author, Doug Underhill’s latest book entitled Salmon Country. We’ll draw one winner from everyone who comments on any of our special holiday themed posts for our annual Twelve Days of Christmas event! at first I didn’t know where this story was going but it ended okay. I’ve read them all. Each of the Twelve Days of Christmas seems to outdo the previous one, but they are all great! Here in South Louisiana it seldom snows. I’m 84 years old and I think I’ve seen snow here maybe three or four times, and mostly just a sprinkling of it. Once or twice it was fairly heavy. If I’m not mistaken, I think snow fell one year on Christmas Day! I’ve got e-mail friends in Canada and they send me pictures of the beautiful Canadian snows when everything looks picture-pefect. She only missed one drinking partner of mine “The Captain”. The dancing snowman and NOW, the disappearing snowman and a glimpse back over the birth and girth of the snowman! WOW, Breadn’Molasses I am growing back in love with you and your creative writers. I do miss the “print” version that was cause for my first love of BnM but this and many other articles that you publish are feeding me the food-for-thought, the smiles, the reminiscence, the “good” stuff that people have in their repretoire of creative thinking shared via creative writing. I am going to google “Chester Clipper” now to see what that has to offer my visual pleasure. Thanks for sharing your creativity Ann and thank you BnM team for diligently connecting us with so much wonder. Brings back memories of frosty snowball games in the 1950s.Thank you. What a story! Like your list of facts! Calvin and Hobbes.Thank you for the historical view as opposed to his hysterical one. Thanks for the laughs and Happy Holidays!! Loved reading about the history of a snowman. Snowmen have always been a fondness of mine, I love seeing them I also used to love building one as well in my younger days. Being in my 50’s we sure do not get the snow we used to as to the global changes. Thank you for sharing. Interesting facts! Now, if only we could get some snowman snow! free days. Wonders are to be made…and it doesn’t cost a cent. Thank you Ann for the facts on snowmen and for writting it so beautifully. 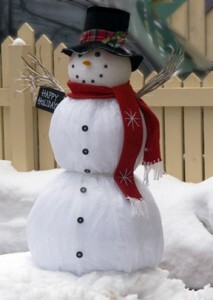 It is a real pleasure to see a snowman, built with love, in someones yard.